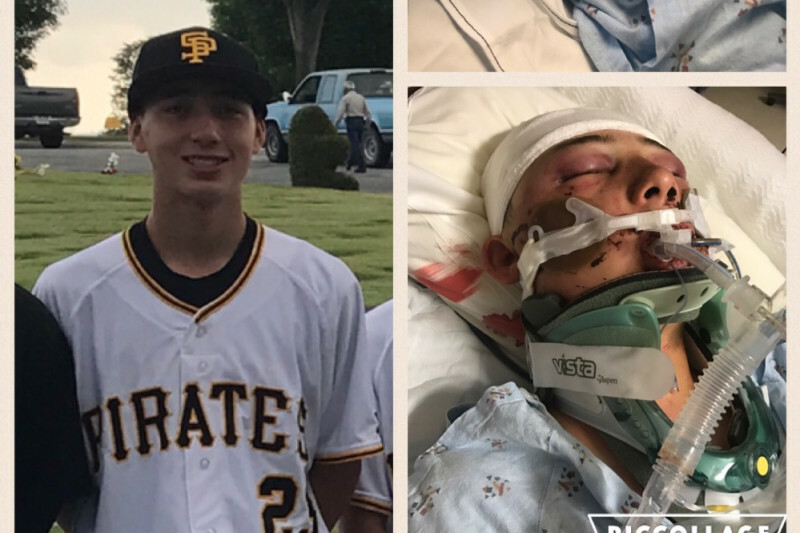 March 30, 2017 seemed like just another regular good day... After a great win of 20-0 against Gardena, one of our own San Pedro High School JV Baseball Players, Evan Jimenez, was jumped and beaten by 2 men when he was walking home from a friends house later that night. Evan was hit over the head/face with a Jack Daniels bottle, stepped on, and brutally beaten beyond recognition and left unconscious to die in an alley. Little did these horrible men realize how strong our Evan is... He is at Harbor UCLA Medical center in ICU fighting for his life!! A mothers worst nightmare has come true for his mom Charlene and many family members. Friday, all 3 of his entire baseball family were there along with many other friends. Praying and asking why... One week prior all of these same boys including Evan were saying goodbye to Jesse, a South High baseball player killed tragically in a car accident. This funeral had a heavy impact on Evan as well as all of these boys. They have been through the unimaginable within just a week time. Charlene is the only provider in the household, and will not be able to return to work for a very long time. I cannot imagine the financial worry she must have and it is the last thing she needs to think about right now. I decided to do this Go Fund Me for her to give her one thing less to worry about so she can focus on Evan. If you can donate anything to help it will be greatly appreciated. Thank you all for your continuedlove, prayers, and support!!! When I was asked by parents and coaches to look into doing this, I really didn't know what it was about. I read all about it and just then decided to do this Go Fund Me because Of many reasons. First one being because I am a Mom, and my heart was completely broken when I received the phone call at midnight from Charlene, Evans mom. I had no idea how to tell my son that his friend/teammate was hurt. Our sons play baseball together, and our baseball family is very close. We do whatever we can for each other and all of our kids. Evan is now home. He has a very long road to recovery. He cannot walk, he cannot process a lot of things yet because the Brain bruising has really taken a toll on him. He doesn't remember much of "the day before" he knows what is going on at the moment but has some short term memory loss. Charlene (Evans mom) cannot work, has zero income coming in at the moment until what little "paid family leave" will pay her. She already got her first "co-payment" from the very first night Evan was found and stabilized at the first hospital. For only 3 hours there her patient portion already exceeded $3000 out of pocket. She cannot leave Evan alone, he tries to get up on his own and passes out, or falls thinking he can walk. Charlene has to drive him now every single day to therapy. She has to pay for home health nurses to come in and check on him daily. She has to pay for a teacher to come in 1 hour a day. Many many co-payments for doctors visits and prescriptions. Charlene also still has a young daughter to tend to. She needs as much help as possible. This money raised will be used to pay medical bills, help pay the mortgage since she cannot work, all the household bills, groceries, all the help Evan needs which is going to be hundreds of thousands of dollars for a very long time! And for Anything else she needs to try and live the lifestyle she had worked so hard for herself and her family before this nightmare happened!!!! All of the love, support, donations, and prayers are extremely appreciated!!! I myself printed out every single prayer sent on here to Charlene and Evan so she can read it to him. He is in complete shock on how much Love and prayers have been sent! It puts such a great smile on his face when he hears the prayers. So again, thank you to everyone for everything! When I started this I had NO CLUE in the world what to do or the fact it would reach the amount it is at today!!! I am extremely grateful to each and every single one of you! Evan decided to "wake up from his nap" and start talking like no other!!! He has proven to be one of the Strongest boys we know and Love ❤️ . Today Evan smiles and talks (still unaware of what has brought him here) but recognizes everyone!!! Evan will be transferred to Millers Children's Hospital to start his new journey of rehabilitation! I speak for Charlene, Evan, and their entire family when I say THANK YOU!! The Love, Support and Prayers means the world to them!! Keep the prayers coming, it will be a long journey but Evan has proven how strong he is!! Today..... Evan sends smiles for everyone!!! YES, Evan is off of the breathing machine but these days seem a lot harder then any. One second he knows us and the next second he doesn't. At times he believes he is still fighting for his life and screams for them to get off of him, this is one of the hardest things I've ever seen in my lifetime!!! I will go up to his face and lay on his shoulder, I tell him, " Mommy is here and you are safe now", Evan will say, "Hugger me mom" (which means hug me as his little sister Jayda says). Then quickly he tells me don't go outside, their after me mom. Evan continually says, "I'm a fighter MOM", and I tell him Yes you are son! Evan asked my Brother in law if he won, and he said Yes, Evan said No I didn't and my brother in law told Evan, "You are always a winner!!! Evan also keeps screaming for his little sister, "Jayda, Jayda Tag!!!! I thought seeing him on a breathing machine was bad, this is worse. This is Truly the worst nightmare, I do not wish it upon anyone!!! Another funny thing that happened is the Dr asks Evan some questions, Are you OK? Evan says NO, Are you afraid, Evan says NO, Are you in Pain, Evan says NO, are you Handsome, Evan says YES!!! When asked who is your favorite Baseball team (meaning Professional) Evan says, "My San Pedro Pirates"!!! I am sooo full of HATE right now, but also soooo full of LOVE... Overwhelmed by the Love, Support, & Prayers from San Pedro, and from so many people from all over the world!!! Please continue to pray for my son, this is just the beginning to a long road of recovery! Thank you again to everyone for your prayers. I am blown away with the amount of love and support coming from all over the place. Our Little town of San Pedro has amazing people in it... We are also getting Donations from so many other High Schools in the south bay & People all over the place. I am extremely grateful and overwhelmed with all of this and cannot wait to tell Charlene and Evan all about it!!!! Thank you everyone for all of the Love and Support!!!! Dan Matthews, I'm sorry for whatever pain is causing you to lash out. A young man was beaten within an inch of his life by two adult men. There's nothing humorous about this. One day you'll grow up and realize that words are just as harmful to those already suffering as any physical attack. 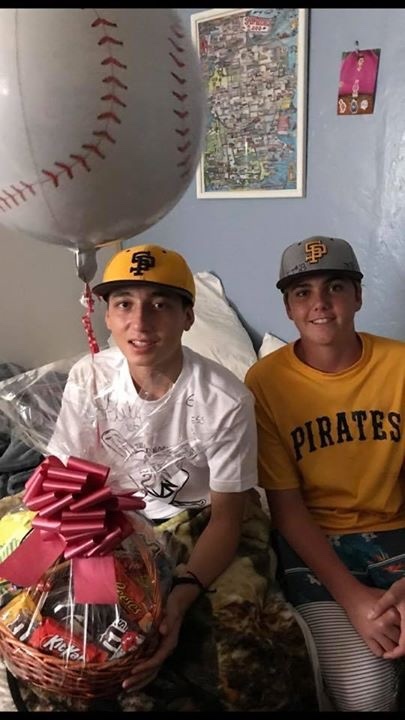 I pray you find peace, that you find empathy, and that you never have to go through what we are going through right now in the San Pedro Baseball family. I'm sorry if that's a problem with you Dan Mathews. That is kind of rude for you to comment on here like this! I had to up the goal bcuz it stops and shuts off if the goal is reached!!! I had many many people contacting me telling me they couldn't open the Go Fund Me page bcuz of this reason! I don't know why you would come on here and make insensitive remarks like his! I don't want to hi-jack the true meaning of this board but I am kind of pleading that someone get the cops to go interview Dan Matthews. He knew Evan, his hatred of even seems in line with the same attitude that nearly killed him. My guess is if he wasn't directly involved, his statements and comments lead me to believe that he is very aware of the reasons Evan was attacked AND possiblly knows the people that attacked him. Please forgive me for taking up this space becasue I know this is about Evan, and my prayers are with him and am crushed at even imagining the kind of mindless cruelty that went in to attacking him. Mr. Matthews should be easy to find. I am sure, same school, and I am fairly certain he wasn't just trolling but actually grandstanding for the person or persons who did this. I could be wrong, but what harm to have the cops go find him and interview him. Ok, that is it, I will say no more on this hateful person. Bless Evan and his family and all who love him. To Evans family, I am battling a terminal illness and can't donate, but I will tell you when your strong willed you have more going for you then people expect. I am surprised I am still here to fight the fight. God has a plan and I have prayed and will continue to send him thoughts of positive energy. I found some very intersting healing meditation sounds which have made a difference. Now keep in mind I am not a hippie type faith healer believer. Until I became ill I never looked at this stuff. It's call binaural sound meditation. Look up brain healing and find one you like, put it on an iPad and play it for him. It relaxes your brain stimulation to promote healing. I would suggest having his family place there hands on him while he listens, it's good energy. (I do sound like I am nutty). Some of them have pop up quick one time ads. That's why I recommend you listen first here is one I use https://youtu.be/VG2-4WupwfI I use this for pain management. I grew up in the South Bay and we hold those up in our communities that are suffering. He did not desearve this but now it's time too heal him. God bless you all be strong through the good and bad days. Why would all of you continue to give this jerk any recognition by mentioning his name. Leave it alone. So all of a sudden he is going to read the comments and have an ounce of humanity… No. I doubt very much that $50,000.00 will cover the medical expenses. So, as far as I'm concerned in a few days the family can ask for an estimate of the cost incurred so far and give a update here and raise the goal amount. There is a lot of caring and generous people in this country/world. Just keep giving updates and adjust require financial need. May Evan require fully and promptly. Someone should check on Dan Matthews IP address he could be connected to the people who attacked the boy here sometimes scumbags like to berate their victims such as this after a crime. Please continue to up it for this family, I cannot imagine what this mom is going through. I didn't even read Dan's comment but let's not feed the negative energy and just turn towards positive energy for Evan and his family! Dan Matthews- Honey there is a hate group out there somewhere that needs you wit and intellect. Go, go find them and be at peace with your people. So sorry you don't have the capacity for compassion. If someone knows how I can completely Delete and Block this POS named Dan Mathews please help me do so before the family sees his rude comments. I have tried now for a few hours. My heart and prayers to Evan and his family. I don't know what I would do if that was my son. May he have a complete recovery and I hope they find who did this to him. Again, my heart to yours. Your story broke my heart. I wish that you didn’t have to go through the terrible experience, but I know that you are a strong & wonderful young man that is determined to get back on your feet. Wishing you the BEST. Sending prayers from another baseball mom. your story breaks my heart i hope you can put all of this behind you.. get well soon!